Hey hi hello, are you a person who needs sleep? Definitely. Is this live footage of you at 1:30 a.m. still trying to snooze away? Maybe. I relate to this gif on way too real of a level. Unless you're a rare angel who can fall asleep anytime anywhere (seriously, how!? ), you probably have trouble falling/staying asleep. It can be especially tough for those of us who are not neurotypical to catch some Zzz's. My personal fav. is when I am so close to falling asleep, but then the cortisol from PTSD floods my body and I shoot up like a magic bean stalk 🙃. But, this incredible weighted blanket may offer a solution. Many people find the weight of this blanket helps melt the stress and anxiety of the day away. It's like being wrapped in a hug as you drift off to snooze land. In fact, weighted blankets are often used in sleep therapy for adults and kids with anxiety, autism, ADHD, or insomnia by offering the gentle sensation of being held! This blanket is made of 100% breathable cotton or 100% bamboo viscose (the choice is yours! ), it has a removable, washable duvet cover, and it's filled with seven layers of glass beads to give it evenly distributed weight. Each compartment has a glass bead sewn into place to prevent movement and noise while you're snoozing away. 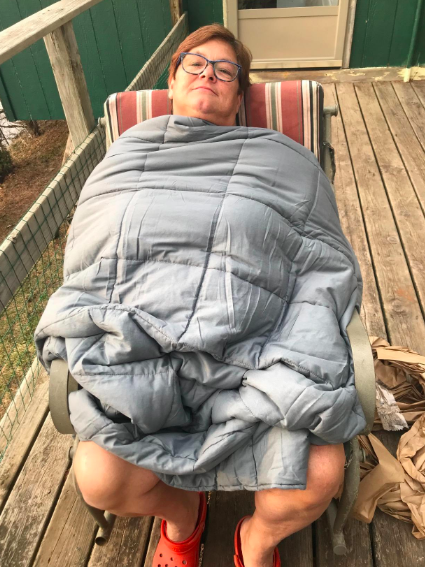 I have two brothers with special needs, so I grew up with a weighted blanket in my house. I've seen firsthand how helpful they can be for people with autism, and I used one myself for two years to cope with PTSD. There is something inexplicably soothing about crawling under a weighted blanket. It helped me fall asleep faster, and reduced my nightmares. I'm not the only one who has experienced the ~heavy,~ restful sleep a weighted blanket can bring. 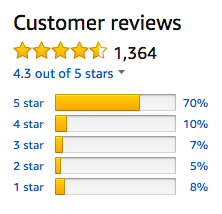 This blanket has an average rating of 4.3 stars on Amazon, and over 1,300 reviews 💤. This supreme weighted blanket comes in a size for kids, all the way up to King size. It also comes in multiple colors and fabrics, and you choose the level of weight to suit your body type. To give you an idea of the weight you'll need, the 5 lbs. blanket is suitable for 90–150 lbs. individuals, and 20 lbs. blanket is suitable for 150–200 lbs. individuals. And FYI, this blanket is pricey, but you already know the sleep of a lifetime is worth every cent. The only downfall of this blanket is you might sleep too well 😴. Idk about you, but after reading these reviews, I'm saving up for the angelic bamboo sea grass blanket so I can sleep like Spongebob. Uhm also, this price point is much more reasonable that what I paid for my weighted blanket, and that was back in the day, too! Get it from Amazon for $69–$169.50 (available in six colors, cotton or bamboo duvet, sizes Twin–King and kid's size, choose from 5–30 lbs. of added weight).